Where There Is No Doctor: A village health care handbook is the most widely used health education book in tropical and sub-tropical developing countries. Based on David Werner's experiences at his Project Piaxtla in western Mexico, it was originally written in 1970 in Spanish as Donde No Hay Doctor. It has since been revised multiple times, has sold over one million copies and been translated into over 100 languages. The book is available for purchase, in either book form or on CD, at Hesperian's bookstore. Because the non-profit publisher's mission is making health information readily accessible to everyone, portions can also be download free-of-charge in pdf format. Fair Trade Recycling: Deleted By Trolls on Slashdot.org? Cal Milmo Redux? Somda: I can do that. retroworks writes "They came to our African city dumps and photographed children burning scrap — scrap that was thrown away after decades of use. Then they said our African businessmen and women had imported the junk recently, and dumped 80-90% of it. Our entrepreneurs have been arrested, and our internet cafes and hospitals denied IT equipment, and our citizens told to buy brand new devices which they cannot afford, or which — when made cheaply — fail at a higher rate than the quality used equipment. 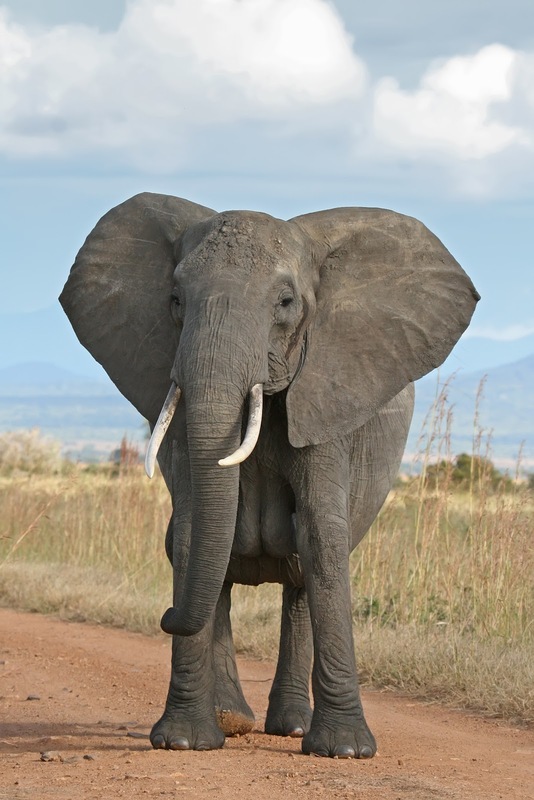 And the Environmentalist who use our children's images keep the money, and don't share a dime with Africa." This damning quote from Jean Frederic Fahiri Somda of Burkina Faso , who opened the Vermont Fair Trade Recycling Summit, was not the first to defend Africans accused of creating "e-waste" dumps in European and USA media — an allegation that has recently resulted in the arrest of 40 African export businesses in Europe, and allegations by EPA that Egyptian businesses who purchased CRT monitors in the USA for $21 each intended to crudely recycle them. At the FTR Summit, Field Studies and Surveys from US International Trade Commission, Basel Convention Secretariat, IDC, MIT, Memorial University, ASU, etc. 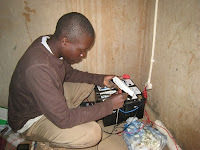 presented at the Summit consistently predicted that 85-90% of used electronics purchased by Africans will be reused for years before reaching the dump. African representatives claimed that USA and European reused equipment is less prone to returns than affordable (Chinese) new equipment." None of the links goes anywhere unvetted or controversial, or to a self-blog. The key link is to live recordings of professional researchers. They all agree with Mr. Somda. The arrests of African used goods importers is a perverse outcome, a type of environmental malpractice, a defamation, an unintended consequence, or even an example of racial profiling gone absolutely wrong. 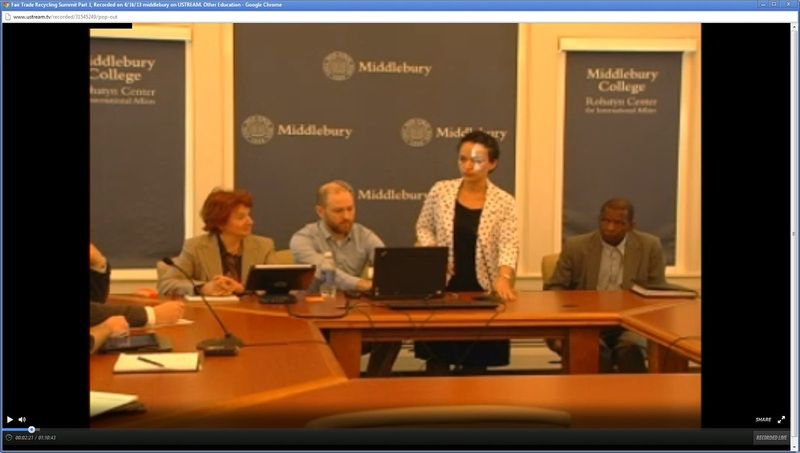 The streaming by Middlebury is captured on USTREAM online. We've had 156 235 online participants (so far). I'm listening over again to key parts of the Summit. In Jon Isham's class, Katharina Kummer Peiry (outgoing chief at the Basel Convention Secretariat) describes how the "group of 77" developing nations first negotiating as "developing nations" has changed. When extremely advanced economies like Brazil and Singapore are put side by side with Lesotho, Chad and Sudan, the functionality of the Basel Convention begins to tear. Frederic Fahiri Somda of Burkina Faso opened the discussion (in French) by speaking about the huge difference between drums of toxic waste solvents dumped on African beaches (a Basel enforcement he strongly supports) in contrast with the cell phones and internet ready computers, which he says are more important and vital to Africa today than paved roads, electricity and running water. He said it was obvious to Africans that buying brand new computers and cell phones was a false solution. People earning under $3000 per year are getting online at ten times the rate of people in rich countries. Arresting the Africans who risk their money and reputations to bring those computers to their home countries is a perverse misuse of the convention. Kyle Wiens spoke from California on the complex negotiations over repair manuals, and the conflict of interest between certain shredding companies and certain original manufacturers and the secondary market. Reed Miller and Andrea Boron presented data from their research, which emphasized the importance of the secondary market, not just in tonnage, but in value and jobs created. Selling a computer monitor for $21 to Egypt is nothing like dumping the monitor on a beach, and even comparing the two is ignorant. Adam Minter of ShanghaiScrap.com described the evolution of circuit recycling in places like Guiyu and India. Chips are actually reused, and the leftover chips are now sold to very high tech smelters in Belgium and Japan. Wire burning is rather obsoleted by new equipment that reuses the wire casings. Oscar Adrian Orta of Mexico, Muhammed Wahab Odoi of Ghana, and Eric Prempeh of Good Point Recycling (orginally a Ghana Tech), put a human face on the buyers, users, repairers and generators of e-scrap in poorer cities around the globe. The e-waste filmed outside those cities, they said, had been generated by users inside the cities, used and repaired for years, and that the conflation of imports with dumps is no more correct in Africa than it would be to assume Japan is sending junk cars to the USA, because we see the used cars at Toyota, Nissan, and Honda dealerships. I'll blog more about the Summit when I have time to listen to more. The highlight to me was meeting Interpol's Therese Shryane, who participated via Skype from Europe. She described the Christmas Arrests of traders in used computers sourced in Europe and destined for Africa. Adelaide Rivereau, our own intern from Europe (France) described here "training" in E-Waste in her masters program as consisting of ten year old Basel Action Network video. Adelaide made a crystal clear point (in an adorable French accent), that if the enforcement community is trained via propaganda films, that the unintended consequences are to be expected as more of a norm than an outlier. Lynn Rubinstein of NERC.org showed intense understanding of Adelaide's point... as the educator of American regulators, NERC has distinguished itself by participating in R2 (Responsible Recycling), one of the lead organizations in defending "geeks of color" overseas. The end of the Summit brought the only terse words - between Martijn van Engelan of Holland, and an attendee from Panasonic. The OEM had said that they couldn't risk their stock and brands being attacked by environmentalists, even if the attacks were unfounded. 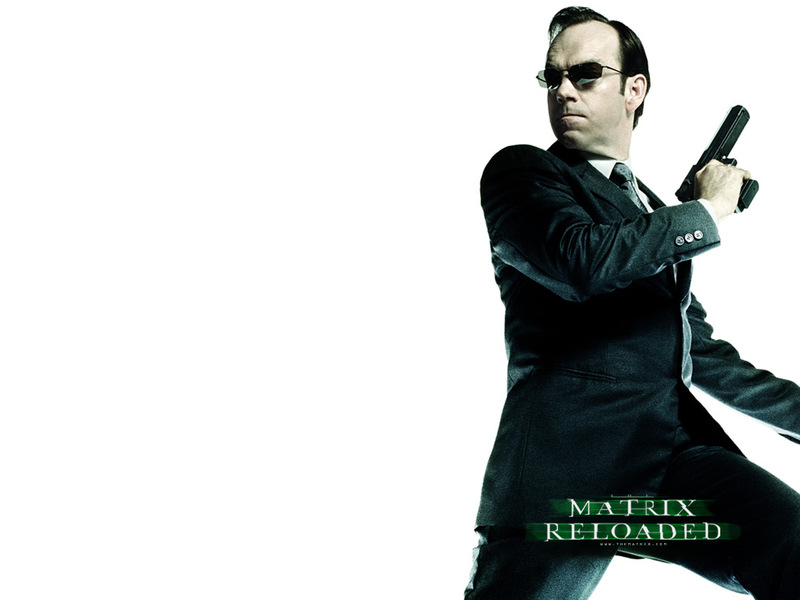 Martijn challenged Panasonic on moral grounds to stand up to the "liars". 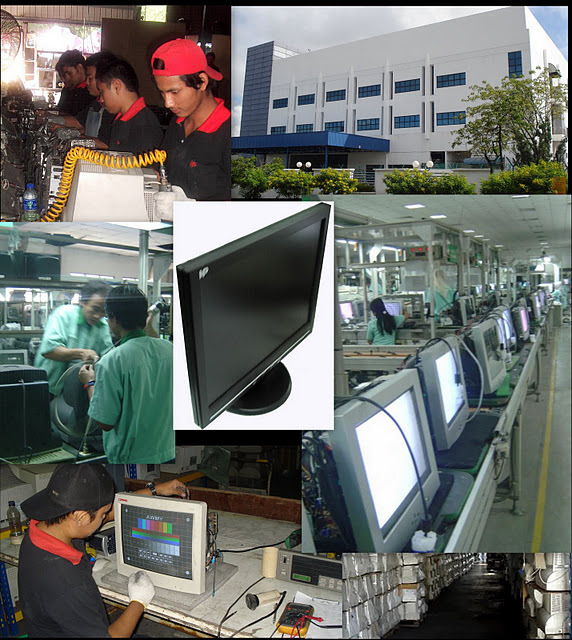 This slide show (link), includes film of one former contract manufacturing assembly factory for Panasonic products in Southeast Asia. When the company no longer got orders from Panasonic to make new CRTs, they began buying used ones from the USA, and refurbishing them with brand new boards for sale in India, Mideast, and Africa. We greatly appreciated David's participation in the Summit, but listening to the final 13 minutes, I think Martijn has a point. If Panasonic will not even defend its own ISO14001 vetted subcontractors, then they cannot defend their own warranty returns. We have seen how the "watchdogs" turned on a dime in the NY Times coverage of CRT glass piles. The CRT glass piles are in the USA, not overseas (where the Watchdogs falsely said 80% of them went). If the Watchdog can so quickly turn and bite the hand of the shredders, they will turn on Panasonic, Sony and Dell's upstream assembly partners and contract manufacturers. Failing to defend your assemblers is a mistake Apple almost made with Foxconn. Americans may think that six billion people in the world wear grass skirts and suffer starvation because they cannot distinguish between a photo taken at a city dump and a description of engineering and original design manufacturing of display devices and smartphones. But the failure of American Geography classes does not extend to the rest of the world, which is today the largest market for companies like Panasonic. If they think their sales are going to be hurt in America by failing to stand up for their partners, perhaps they should consider the benefits of multicultural friendships. That's has been my takeaway from trading overseas. At yesterday's Fair Trade Recycling Summit, we tried to make it a "giveaway". 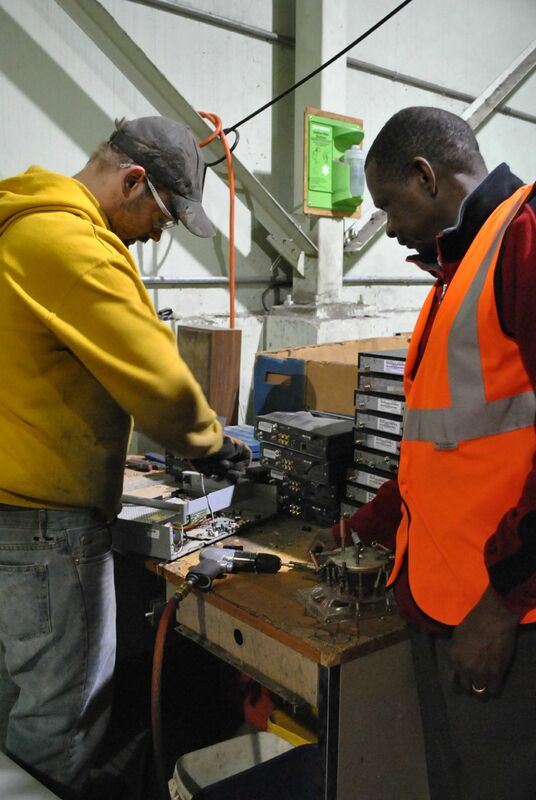 Middlebury College Environmental Studies is hosting a Summit of researchers of "e-waste" or WEEE exports on April 16. The Summit will be streamed online at www.fairtraderecycling.org. It is funded in part by a Canadian grant of $479,000 to Memorial University, University CP de Peru, and University of Southern California (LA). Researchers organized the Summit in order to interview actual importers of used electronics in five countries. They will be joined by experts from MIT, Monterrey Tech Guadelajara, University of Amsterdam, and Universite Paul Cezanne of France. A representative of the Swiss Basel Convention will speak about 2-year studies in Nigeria and Ghana, and the US International Trade Commission will update attendees on its new 2013 calculation, that 88% of used electronics exports are reused. In fact, Researchers from Peru, Basel Convention, US ITC, and elsewhere have consistently found 85%-90% of the used electronics purchased by Africans, Asians, and South Americans are reused, and that the 10-15% fallout is comparable to new goods. Most experts say that material filmed at dumps is collected from cities in emerging markets which have used up the equipment imported decades earlier. IT importers from Egypt, Ghana, Burkina Faso, Peru, Indonesia, Malaysia, Mexico, Angola, and Colombia are attending the Summit, to meet students, and explain that they cannot afford to pay $21 per unit, plus thousands in shipping, to burn material on the ground. Fair Trade Recycling, an international NGO based in Vermont, organized the Summit. EPA, Interpol, and other enforcement agencies have committed to participate online. The enforcement agencies will be asked who originated the statistic that 75% of the imports are dumped and burned (creating a presumption of guilt among used IT importers). FTR representatives hope to shift the burden of proof, so that exports of used IT are not presented as de facto "e-waste", and to address the need for appropriate recycling techniques and hand disassembly systems. The association of exports with "primitive" or "informal" recycling and dumping (via widespread coverage by CBS 60 Minutes, Frontline, USA Today, Oprah, NPR Fresh Air, etc.) doesn't address the problem if those wastes were not recently imported. (a Seattle NGO has emerged as the probably source of the claim that 75%-90% of used IT imported by Africans are immediately sent to be burned in dumps). How can there be fair trade without people trading with each other, and how can this happen if they don't know each other? I make many arguments about the wisdom of prohibitions, and the unintended consequences of isolationism in the name of anti-exploitation. Drawing the blinds on Africa won't make the poor children go away. But I also know that the e-waste being generated by the "other billions of people" in the non-OECD is piling up, just as it is here. Exporting used equipment may not be the direct cause of those piles, but it will not by itself solve those piles. Fair Trade Recycling is intended to attach conditions to the sale of used equipment which seed the collection and proper recycling of that equipment in the nations generating it. When IT buyers from Africa come over to inspect equipment they may buy, they are exposed to a facility which is properly dismantling the equipment they don't want. They don't see a big heavy shredder that they could never hope to afford. Instead, they see hand disassembly, people doing jobs they can imagine their family or tribe members doing. Fair trade recycling is about getting to know each other. Even if no price is agreed to and no sale takes place, simply agreeing to meet an African, Chinese, or South American buyer, to shake their hands, and to listen carefully to learn what it is they want to buy, that is getting to know the e-waste trade. Creating laws and corporate policies which ban the trade preserves ignorance. I hung out with a couple of very nice people at the ISRI recycling trade show this week. Excellent people. They were talking about people who stack and pack old televisions, like the ones that make up 60% of our collections. I said I'd never met such a person. I think that maybe if they relax their policies against exporting used equipment, they will hear out more of the buyers, and get to know them. Whether or not they make money, they'll learn how make a little more rare the stereotype that never actually exists. Most of the information that has been provided online and through the press about used electronics trade and recycling has been concocted by people who don't know what they are talking about, and are making it up as the go along. That's the same problem with people who criticize alternative marriages, or want to choose neighborhoods or co-workers based on race or color. The more we isolate ourselves, the more we don't learn good. The Vermont Fair Trade Recycling Summit is collecting 2-3 minute videos, written testimonials, and quotes about the concept of fair trade as an alternative to export bans and prohibition laws. We had far too many people who wanted to attend and present their ideas, even after opening a third class. There will be online streaming of the FTR Event. That means there will be gaps between classes which is an opportunity for you to present your case, pro or con, to thousands of viewers in Asia, Africa, and Latin America. The only warning is that there are plenty of facts on the table. Dozens of import/export businesses are talking about their processes, and how fair reuse can actually fund the manual disassembly of used electronics they generate in their own nations. Send your 2 paragraphs, or video or link from youtube/vimeo/viddler, to Testimony (at) wr3a.org. 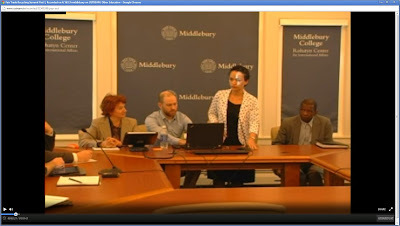 Reuse, Repair, and Recycling Professionals from Five Continents to meet at Middlebury College Summit. Hosted by Middlebury College, visitors sponsored by Good Point Recycling and the World Reuse, Repair and Recycling Association. 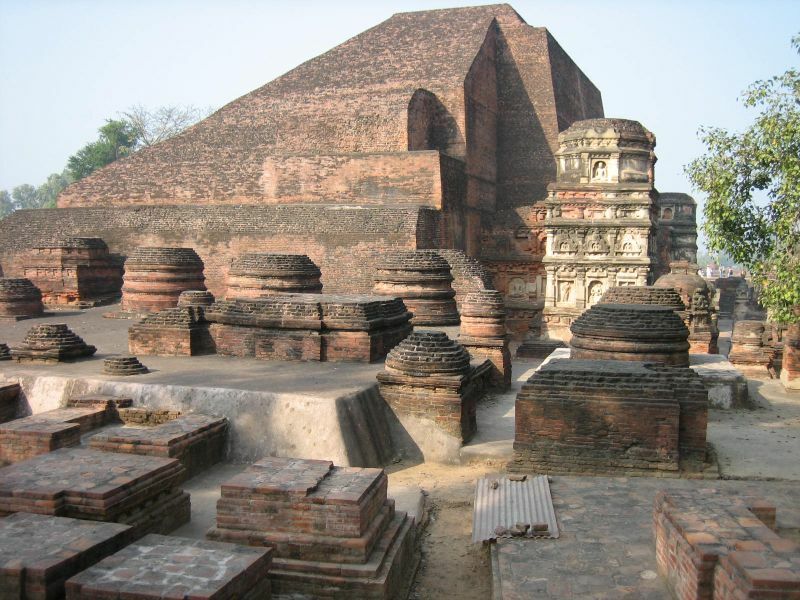 Two presentations by internationally recognized figures in the field. A third forum will be held for Middlebury College students and community members interested in debate over export of used goods and Fair Trade Recycling. Andrea Boron, US International Trade Commission. Used Electronics Exports (February 2013). Adam Minter, Author, “Junkyard Planet”. Adam is a reporter for Bloomberg, based in Shanghai, who writes columns for BusinessWeek, Bloomberg, Recycling International, and The Atlantic. Katharina Kummer Peiry, EcoConsult (Geneva, Switzerland). Former Executive Secretary, Basel Convention Secretariat 2007-12. Former UNEP staff, Nairobi Kenya. Eric Harris, Assoc. Counsel/Dir. Of Govt. & Intl. Affairs, ISRI, (Washington, DC). Industry representative to UN PACE program. Josh Lepawsky, Geography, Memorial University (Newfoundland, Canada). Chief researcher, $479,000 Fair Trade Recycling research grant. Ramzy Kahhat, Professor of Engineering, University Pontifica Catholic de Peru, FTR grant. Martijn Van Engelen, Aatelco CEO, founder of Fair Trade Electronics in Holland, exporter. Lynn Rubinstein, Exec Director, NERC.org. Board Member, R2 Solutions. "African On African Externalization Matrix"
[Lyons, France April 1, 2013] Multiple European and American Police forces converged on African used computer businesses in Egypt, Nigeria and Ghana today, seizing equipment destined for reuse in the growing cities of Cairo, Accra and Lagos. The Africans were called part of an extremely organized syndicate which imported used "e-waste" from Europe and the USA, and laundered it for two decades, through a matrix of African "middlemen" at hospitals and internet cafes. Eventually, the importers planned to turn it in for disposal at African dumps and junkyards, many years later. The sting on trans-boundary and trans-neighborhood movement of used goods was described by International Police and EPA as a complex system, or "e-waste matrix". The trans-boundary movement had not been apparent, and therefore hidden. According to the agencies, African buyers based in the UK, USA, and EU have cleverly avoided used electronics which were obsolete, in order to "bide their time" in a network of African-on-African reuse, planning eventually to burn the computers in a fire. "The buyers are organized, and therefore we can call them 'organized crime'," said Emile Lundermiller, author of Interpol's 2009 Report on E-Waste Export Crime. "It's ingenious. They can apparently hide the computers, monitors, and televisions in plain sight for decades, in living rooms and offices." Lundemiller continued, "Africans pay for it with African money, and distribute it into the cities before we can even catch it." He cited the PIOOA statistic, that up to 79.5% percent of Africans are actively involved in the purchase, sale, repair, use, and reuse of electronics which ultimately victimizes Africans. 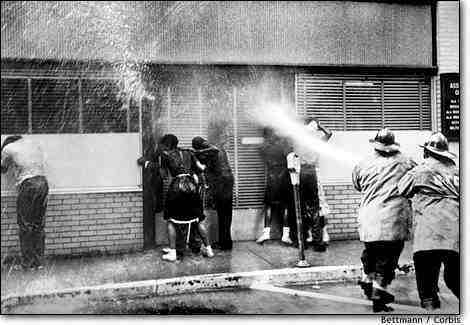 "It's environmental racism of the worst kind, African against African," said Lundemiller. "Africans routinely externalize waste to other Africans, exploiting each other, using more Africans as the middlemen, in a cross-fire of repurposed gear." As profiled in Lundemiller's 2009 Interpol Report on E-Waste Crime, the initial e-waste transaction is initiated by Africans, based in Europe, who cleverly test equipment prior to export. 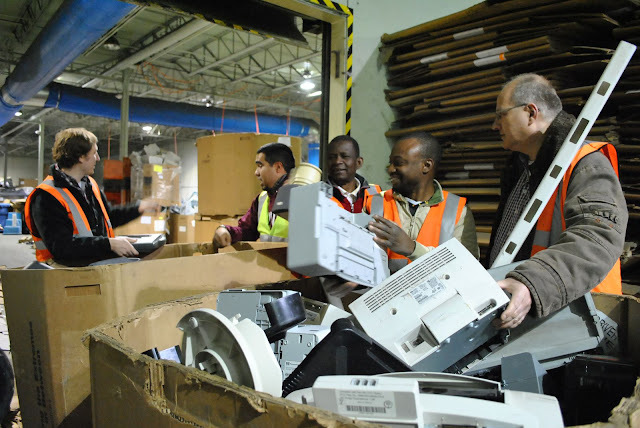 By avoiding very old and obviously obsolete equipment, the African buyers make the equipment pass as working and repairable, exempt from European E-Waste shredding laws. "They cleverly avoided the older, larger TVs. This would have been difficult to track if their inter-African system of trade hadn't tipped us off," said the enforcement agency's undercover spokesperson, wearing a grass skirt, and carrying a canvas drum. As documented in studies and audits from the Basel Convention Secretariat, African buyers showed a strong preference for newer-looking, black plastic, major brand name, and working equipment. Usually the ones rejected had more copper and precious metals, but the patient importers forgo the cash in order to stymie investigators. Between 85% and 90% of the e-waste the Africans received in Lagos was made to function to such a high level that the e-waste could be passed along, for years, hidden through normal retail channels. After decades of reuse "laundering", the copper and other raw materials were to be harvested at African scrapyards. - Basel Secretariat studies (Ghana, Nigeria) find 85-90% of imports repaired or directly reused. In the latest break-up of the Egyptian "E-waste Cartel", the Cairo importer paid (according to EPA) $21 per CRT monitor, enough to ensure bad ones were removed and good ones relabelled. Once the Egyptian government spotted the use of the monitors in internet cafes, prior to the revolution, it reacted by decree. Any CRT, working or not, is defined to be "waste" if it came off an assembly line more than 5 years ago (a time few CRT monitors were being made). Once the Egyptian government dictated the working equipment to be "#ewaste", and seized them to halt "use", EPA was able launch its arrests of Americans selling working monitors into that market. (China announced a similar move, labeling books with images of the Dali Llama to be "e-waste like"). Lecturing a room of confused police and detained Africans, Jim Puckett, Executive Director of Basel Action Network in Seattle, Washington, described the Reuse Matrix as a kind of internet "Rabbit Hole". "The African Reuse Matrix is a system. That system is our enemy. But when you're inside, you look around, what do you see? African Businessmen, teachers, lawyers, carpenters. The very minds of the people we are trying to save. But until we do, these people are still a part of that system, and that makes them our enemy. You have to understand, most of these people are not ready to be unplugged. And many of them are so inured, so hopelessly dependent on the system, that they will fight to protect it." "Ultimately, we were correct about exports of intact units being dumped and burned," said Jim Puckett. 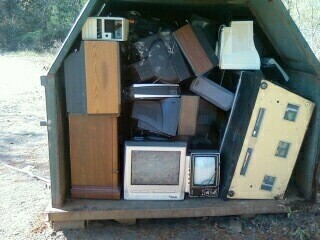 "It may take decades, but we are now tracking the disposal of televisions purchased by Africans as long ago as 1978. What hath we wrought??"